This is one of my favorite breakfast recipes, ever ever ever. One quick question: is this breakfast? Forget that. In my house, today, it was breakfast. One thing that should never be allowed to happen in the universe is waking up early on a non-work day. The neighborhood dogs here in the Philippines need a lesson in the rules of the universe because this morning they woke me up at 6am. After laying in bed and thinking villainous thoughts about how to get my hands on a few dog tranquilizers, intermingled with a few spiteful thoughts about how in the world Bjork can sleep through their barking and how he’s getting way more sleep than me which is SO not fair, I decided to get up. But you know what I always say? The early bird gets the sauce. This is the epitome of bread pudding. It’s so easy, so cozy, and so sticky in a way that can only be good with bread pudding. It’s so filled with juicy rum and butter raisins which I will make an exception for this time, and so perfect for soaking up a little something named Hot Butter Rum Sauce. Which, in and of itself, makes this recipe worth your while. I guess there are a few good things about getting up early and mostly they are delivered on a fork and dripping with sugar. 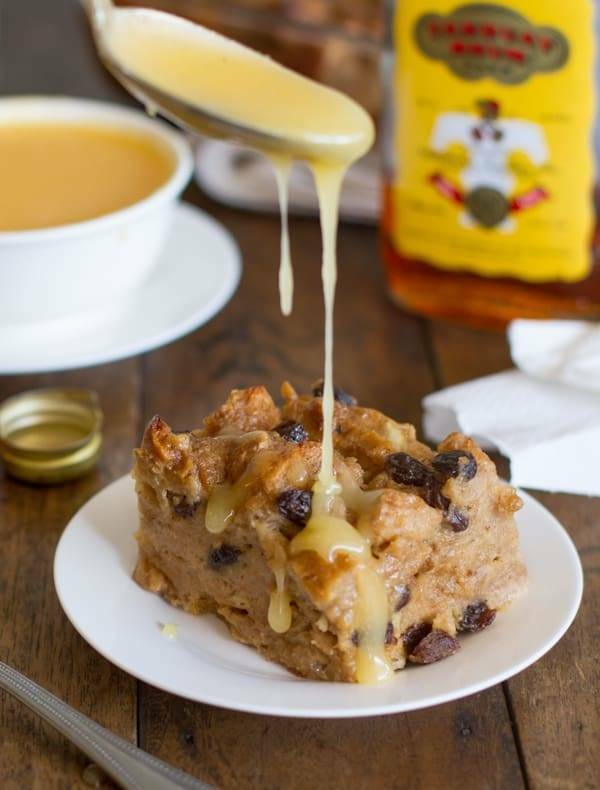 This bread pudding with hot butter rum sauce is the best bread pudding I’ve ever had! The sauce alone will change your life. For the bread pudding, cut or tear bread into pieces and place in a large bowl. In a medium saucepan over low heat, melt brown sugar, milk, butter, cinnamon, vanilla, raisins, and 2 1/2 tablespoons rum. Stir constantly until sugar is dissolved. Pour over bread and allow to soak for 30 minutes. Preheat oven to 350 degrees. Add 4 beaten eggs to the soaked bread mixture and stir gently. The bread should be completely saturated with the egg and milk mixture. Pour into a buttered 9-inch square baking dish and bake for 40-50 minutes until the top is browned and the middle is set. Do not overbake or the bread pudding will become dry. For the sauce, melt the heavy cream, white sugar, and butter in a medium saucepan over low heat. Do not boil or the mixture will start to crystallize. When sugar has dissolved, add 1 1/2 tablespoons rum. Pour the warm sauce over each slice of bread pudding before serving. Good times, friends. Good times. I love how you warn us to not to over-bake and why and not to boil and why. I find this type of instruction more helpful than just mix and stir. It helps to be on the look out so you don’t ruin the dish. As soon as the weather cools down a little this is on my must-make list. This is an excellent way to use up bread. Hahaha 🙂 I love thinking of you with my little friends from last year. They are in good hands!! Can’t wait to try this! Has anyone tried this with bourbon instead of rum? I adore bread pudding! This recipe looks fantastic! Yum. My love for bread pudding = 100%. Paul’s love for bread pudding = -300%. Really? Who can hate bread pudding? Maybe the rum sauce will change his mind…. I love your blog. I found you through Pinterest. 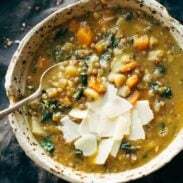 One of my friends posted your gorgeous Chicken Bacon Wild Rice Soup and it drew me in. I will be making this soon. I am also from Minnesota, Blaine to be exact and on another odd note; I was born in the Philippines on Clark Air Force Base. What a small large world we live in. Teaching in an orphanage….what a blessed woman you must be. The world needs more people like you who help those who really need our love and support. This bread pudding also looks amazing! I will have to make this and portion it out to take to work with me. Wow! That is so cool Shelah! I have lots of friends who live in Blaine and actually we go to church at a small new church in Blaine as well! It’s called Renovation Church. We are in that neck of the woods almost every weekend (when we’re not in the Philippines). 🙂 Thanks for getting in touch – I love making connections like that! I found this through the “11 favorite bread pudding recipes” post. I made it last night and it’s really great. I only had about 6 cups of bread, but didn’t want to mess with the mixture, so I cooked it for a little bit longer and am enjoying its deliciousness again this morning. The pudding is moist, has great flavor, and how can you go wrong with a sauce made of butter, sugar, cream, and rum?? Hi, I used to make puddings without sauce, I’m glad I’ve found your website because now I can try something different. Thanks for this recipe. I hope you enjoy your stay in the Philippines. By the way I am a Filipino but I am currently staying here in Saudi Arabia. GOD BLESS! Thanks for the comment! I hope you like it! Bread pudding with rum sauce…yum! Sorry it didn’t work out for you! I clarified some of the instructions so hopefully that helps. And here’s the original recipe that I adapted this from. The directions on that one might be easier to understand, but it just doesn’t include the sauce. My mother used to make us bread pudding for Christmas morning 55 years ago. I was gifted a bottle of rum and thought of it while making rum balls. I modified it using nutmeg, cloves, allspice and substituted honey for some of the brown sugar. I soaked the golden raisins in the rum overnight before adding them to the mix. I also tempered the eggs into the milk, butter and spice mix before putting it on the bread to soak. My last change was to candy/toast some whole pecans with a little butter, brown sugar, cinnamon and my husband’s honey from his beehives and then spread them out on top of the bread before baking. I doubled the recipe and put it all in a huge lasagna pan so it is thinner because I don’t like the inside to be too soggy. I cooked it a little longer than 50 minutes, keeping an eye out so it didn’t burn because I like it to be crisped on top. There is no need for modification of the rum sauce–it is so perfect! Why did I make so much of this, other than because it is delicious!? The last time I made bread pudding before Thanksgiving I cut up the leftovers into small squares and put them in snack bags in the freezer. I put the rum sauce in the Glad Mini Rounds (8 to a package at the grocery store). Then when the mood strikes one of the three of us (which must have happened often because the freezer is now empty of them) we defrost one in the microwave then pop it in the toaster oven to crisp it up, heat up the rum sauce in the microwave and pour it on. My son said he took to hiding them behind his frozen pizza, but somebody took them so I “needed” to make him more! I need more rum recipes as there is half a bottle left! I followed the recipe exactly with the exception of using homemade white bread rather than French bread, and it was one of the most amazing desserts I’ve ever had. My neighbours were over for supper and now they think I’m a kitchen goddess. Thanks for sharing! Awesome! love hearing that Bonita! I love hearing that! Thanks for the comment Carol! 1 or 2 should do the trick, depending on how big they are. Made this last night, amazing! I wouldn’t change a thing. That’s great, Colleen! We love hearing that!